I find myself rendered almost speechless by how incredibly lame this character is. If bad were a scale that went to ten, "Truk" would be an eleven. At first I assumed this incident resulted from some sort of Marvel-led takeover of the DC offices in an effort to drive them out of business. Or perhaps it was a bad April Fool's joke. But no. 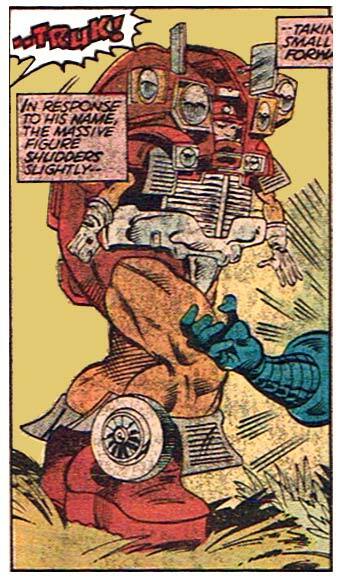 This is an actual, bona-fide, yes-they-really-meant-to-do-it super-villain. And thus I am legally required to unleash the mockery. Look at that drawing and tell me how in the heck this guy is supposed to rotate at the waist. Or see anything except what's directly in front of him. Or use the two side mirrors mounted above his head, not to mention the rear-view mirror which, I assume, offers a spectacular panorama of the inside of his helmet. Cab. Whatever. I bet he's got relatives back home just itching to get into the game, too. There's "Sub-Compact", his pint-sized cousin who's as energy-thrifty as he is ineffective. And "Vann", the overweight and out of date mother who prowls the local soccer fields for prey. Just hope he doesn't call in "HummR", his enormous, bloated, begrilled brother, built to roam in the unchartered wilderness but who, alas, is doomed to forever prowl the streets of suburbia for fear of getting mud on his flaps. I've seen some bad costumes in the course of seeking inspiration for HeroMachine elements, but this one is definitely among the worst. Images and characters are copyright DC Comics, "The Green Lantern", issue 202, 1986. You know you just validated something for me. I got into an argument with a friend that claimed that the Green Lantern fought a Transformer. With Green Lantern being DC, and Transformers running on Marvel then, and me not remembering them doing a crossover before the “Just imagine Stan Lee creating the DC Universe” mishap in 2002. 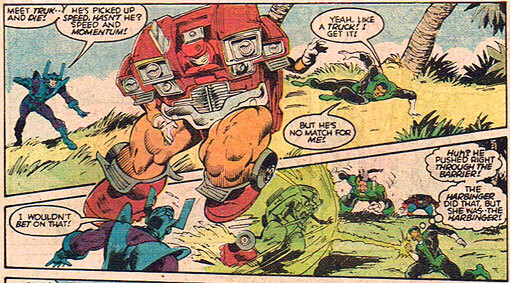 I guess we were both right, he mistook TRUK as a Transformer, and I feel vindicated in knowing the Green Lantern never fought Optimus Prime. This pic got me singing “Trucking” from the Grateful Dead! I wonder if his alter ego is Casey Jones? Also, Why does he have large legs and tiny, tiny arms?